End of Semester Wrap Up – Thank You! Another great semester has gone by, even quicker than the last! 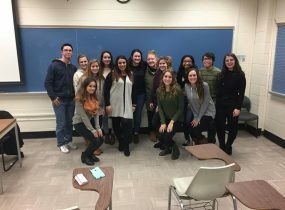 Our members have made this semester a memborable one, and the PRSSA eboard could not be more grateful! Fall 2017 marked a semester of some of our greatest events and attendance numbers, and we are proud of our growing community! Be sure to come back in the spring for even more events, opportunities, and memories! Members of our leadership team were able to attend a part of PRSSA’s National Conference in Boston October 8th. The team had a great time and cannot wait to attend more regional conferences and National Conference again next year. The keynote speakers were Nick Ashooh from APCO Worldwide, and Patrice Tanaka from Joyful Planet, LLC. 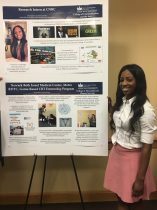 We were then able to attend a breakout session on the topic of invention in public relations. 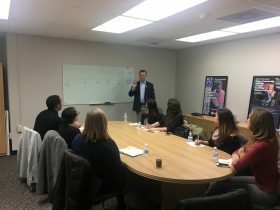 Adam Ritchie, the speaker, told an interesting personal story about how creative public relations practices can create the need for a new product. 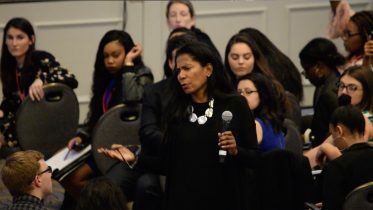 We were then able to meet Judy Smith, crisis management legend, and hear her speak her truth and wisdom. At the end of the day, there were officer discussions, which is what we were most excited about for the day. 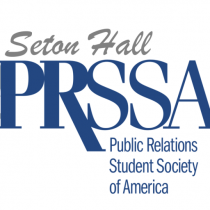 Stay up to date with our travels and events on all of our social media channels, @setonhallprssa! 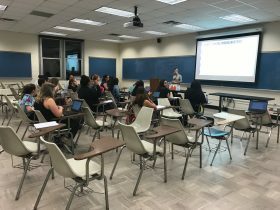 PRSSA’s last meeting discussed interesting topics like the history of social media, how to use social media as a tool for personalization and personal marketing. From Seton Hall’s Strategic Communication graduate program, Professor Ruth Tsuria was the guest speaker of the night. She began the workshop-style lecture by making the attendees google themselves and see what some of the first things that pop up are. This exercise was used to demonstrate what a potential employer may see when researching you. She then proceeded to give a brief history of social media and gave some great tips for social media usage! Google yourself from time to time, see what comes up! For more engaging content like this, come to our PRSSA and Litore Agency meetings, every other Tuesday at 7:30 in Fahy Hall room 131. Welcome back to a new year of learning and expanding your horizons! We at PRSSA want to extend our warm welcome to all of those who would like to learn with us throughout the school year. We have some amazing events, meetings, and agency visits planned and we hope to see you there! Make sure to check back here for frequent posts about industry news and PRSSA/Litore updates. We are so excited for what this year will hold for us, and we hope you are too!